Twenty-one years ago the world was introduced to the mysterious universe of Gabriel Knight from prolific games industry creative Jane Jensen. This month marks the celebration of that anniversary, with the release of the Gabriel Knight: Sins of the Fathers remake – enhanced with new visuals, audio and, in some cases, tweaked to preserve the original game's intended emotional resonance. One sequence, in particular, stands out to Jensen, she tells me: the police station. In the original 1993 release, the scene plays out light and even campy: "When Gabriel goes to the police station and breaks into Mosely's office [...] in the game there was a puzzle sequence that had to do with cops and doughnuts and distracting them. It was all very silly," Jane Jensen admits. The sequence, she says, has been changed in Gabriel Knight: Sins of the Fathers – 20th Anniversary Edition (one year late, but close enough), to better parallel Jensen's original novelization. "I wrote a book about Gabriel Knight, I mean I wrote it as a novel after I had written the game, and so there were a few things that I had put in the novel that were new that we ended up rolling back into the remake," Jensen adds. In the novel, the police station sequence was written to be "much scarier," and given the opportunity to better convey the story's suspenseful hooks with the remake, the sequence was changed to better mirror the novel. It was the first of a few tweaks made in Gabriel Knight's return. Though the tonal shift in the police station sequence makes more contextual sense, Jensen didn't want to change or add content "for the sake" of doing it. Some alterations, however, were inevitable and will undoubtedly disappoint fans of the original game. In 1993, Gabriel Knight was graced by the voice acting talents of Tim Curry and Mark Hamill, to name a few; whereas the remake welcomes a new set of actors. "I don't know that you can look at the new music and art and think it's a 'less than' product," Jensen says when asked how fans of the original will respond to the replaced voice cast. "We had such a phenomenal star cast originally, anything less than that is going to be less than that. If you're asking me if it's a concern that will impact sales, you know I don't worry about that extensively. I think it would be disappointing if people wouldn't even give it a shot because of that." "There's not really much we could have done" to retain the original cast, she says, singing the praises of the remake's new cast – a group of actors in unenviable shoes. For those looking to relive the classic series, Gabriel Knight's original adventures are available at GOG.com, but as the platform is generally built on nostalgia, it's difficult to broaden the appeal of twenty-plus years old franchises. A remake became the most likely solution, Jensen says. "Part of the audience we're hoping to reach are new players. The kind of people who play casual games. More female players and maybe more mature players, for example. I think GOG tends to, at least it's my impression, that it's more of a fairly serious hobbyist site. And I could be entirely wrong. But I think we're trying to reach more of a Big Fish Games-slash-tablet kind of market." Like many video game remakes, one of the most dramatic differences between Gabriel Knight's 20th Anniversary release and the original classic is reflected in the technology used to create the world. 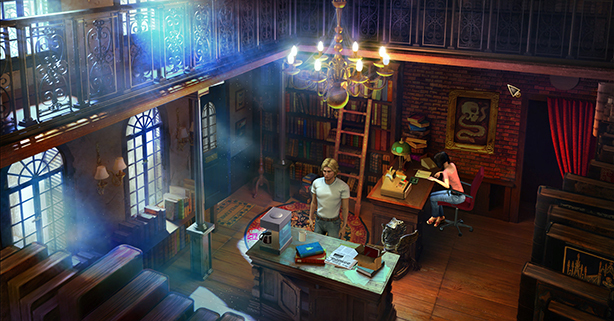 With graphical fidelity so rich in modern gaming, it's now possible to close-in on puzzles and areas of Gabriel Knight's universe in a first-person perspective. There are a few extra clicks throughout the game to show off that new quality bar, asking players to examine things a little more closely while also expanding on the detail in Jensen's world – a world crafted by a team brought to life by fans. In 2012, Jensen and her husband, composer Robert Holmes, turned to Kickstarter to help fund Pinkerton Road Studios – a new development house with its eyes on creating fresh adventure game experiences. Seeking a funding goal of $300,000, Jensen promised at least one game from the studio – the concept of which was voted on by contributors. Although the campaign exceeded its modest goal, Pinkerton Road's first project – Moebius – was limited by its crowd-sourced budget. "I would probably not use it again as a sole means of financial support," Jensen says of Kickstarter. "We ended up raising, I think it was around $435,000, after everybody takes their cut, we had about $390,000. It was really not enough money to make a game like the game that we made. So it's been a difficult few years, we ended up putting a lot of our own money into it as well and the team was on starvation wages." Pinkerton Road also found it difficult to market their game, unable to spend money on marketing or "hire much help on the business end." Ultimately, Moebius failed to live up to expectations, critically and commercially. "The PC and Mac sales haven't been very good, so it's not something that we would probably do a sequel for," Jensen admits, hoping that the game's eventual release on iPad and Android tablets will be better targeted at the market. Pinkerton Road Studios is only really composed of two people today: Jensen and her husband, she tells me; its projects are co-developed by Phoenix Online. Jensen says there's concern in the landscape of Kickstarter where asking for a reasonable budget, one that reflects the actual costs of game development, will be unsuccessful. "It seems like there are more campaigns failing, like the 7th Guest one, where if you really ask for reasonable budget there's a good chance you're not going to make it. And if we were going to do it again we would have to be prepared for that eventuality. "So, it's not something that I would recommend or do again, it might be something where if we had part of a budget raised through a publisher or something we might. But it's really difficult to make a game based solely on Kickstarter money, at least at the levels we were able to raise. Probably not if you were able to raise $2 million on it," she adds. But even millions cannot guarantee a smooth development process, as Double Fine learned when it turned to Steam Early Access in order to collect additional funding for its adventure game project after collecting $3.3 million from Kickstarter. 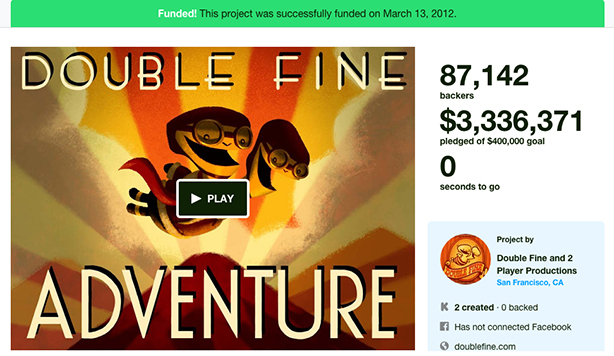 As one of the first visible Kickstarter projects from a known developer, Double Fine saw great success with its adventure game campaign. Company recognition power has slowed project successes however, and some projects have relied on intellectual properties to gain traction – projects like Wasteland 2, Shadowrun Returns and Torment: Tides of Numenera, to name a few. Part of Pinkerton Road's Kickstarter was the possibility of a second game put into development from the single campaign. If the campaign reached $600,000 – twice the campaign goal – Mystery Game X would be put into development. The goal was never reached and it was only later that the world would be told the mysterious game was the Gabriel Knight remake – as part of a licensing agreement with Activision. Whether or not revealing that information during the campaign would have boosted contributions will never be known. Sierra & Gabriel Knight ... What Year Is This? Through publishing agreements, Pinkerton Road would later greenlight the Gabriel Knight: Sins of the Fathers remake without funding from fans, but Jensen said the desire to return to the series has always lingered. "Over the years I had approached the license holders several times," Jensen said of acquiring the rights to develop a new product in the Gabriel Knight franchise. Though the series was established under the Sierra brand, that company's portfolio has exchanged hands multiple times. In the case of Activision – the current rights holder of Gabriel Knight – they pursued Jane Jensen. "They contacted me a couple of years ago during the time of our Kickstarter because I was just very visible during [the campaign] and there were people in-house [at Activision] who really wanted to do something with those Sierra franchises. They pretty much just called me to brainstorm to see if I had any ideas and what I thought about the market. "I knew then that there were people in-house that had some clout and were interested in doing something with those Sierra games and that eventually translated into this new Sierra brand, which I think is wonderful." In August 2014, Activision surprised the world by reviving the long-dead Sierra brand. The new Sierra will focus on independent teams "developing innovative, edgy and graphically unique games, including new IPs and contemporary reimaginings of beloved Sierra classics." Currently two titles have been announced for the brand: a revivial of the Kings Quest franchise and a third Geometry Wars title. Jensen says she hopes Activision's revival of the Sierra brand could be to the company's classic catalog as Telltale has become to the Lucasarts adventure games. 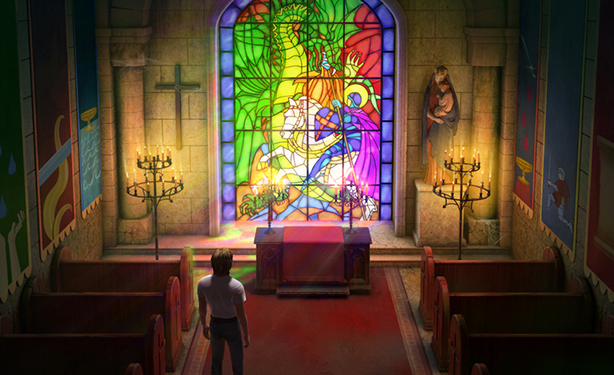 There's a commitment to Sierra's classics from Activision's new brand, Jensen says, revealing that the internal group allowed Jensen's studio to remake the first game in the Gabriel Knight series as a stepping stone toward the Sierra brand revival. "I just have the rights, right now, to do the first one," she says. "Gabriel Knight rights in general are still with Activision and I really hope that they would love to make more GK games. I think they will and of course I'd love for Pinkerton Road to be involved with that." Remakes of Gabriel Knight sequels, however, would bring with them new sets of challenges. As a franchise that evolved alongside the technology of its day, each series sequel is presented in wholly different gameplay styles. 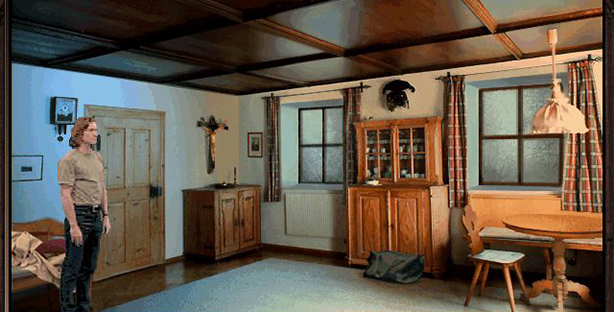 Gabriel Knight 2: The Beast Within [above], for example, is a full motion video game; Gabriel Knight 3: Blood of the Sacred, Blood of the Damned was a 3D adventure. Jensen says her selected style for potential remakes of the franchise's sequels would depend on who was funding the project. "The reality is that if we remake those titles it would probably be with a publisher, like Activision. It's very likely a publisher like that is not going to want to do an FMV game. I would imagine it would be, either similar to the style we are doing for [Gabriel Knight 20th Anniversary] or maybe full 3D," Jensen explains. "It's not necessarily my first priority to remake [Gabriel Knight] 2 and [Gabriel Knight] 3, though I certainly wouldn't turn down a project like that. I would love to have them all be nice new shiny boxes on a virtual shelf. My first priority would be to work on brand new stories. I'd love to see three new Gabriel Knight stories, three whole new games." The future is unclear, but today fans can explore the remastered world in Gabriel Knight: Sins of the Fathers – 20th Anniversary Edition, available for $19.99 on Steam, GOG and from the online store of co-developer Phoenix Online.